All steel organizing accessories are extra sturdy and useful. 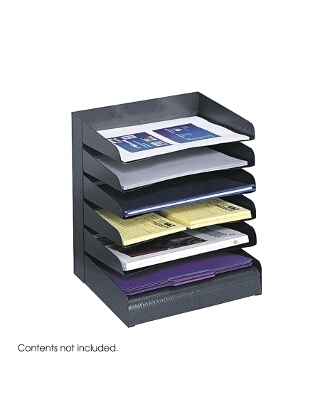 Answering today's need for continuing workplace efficiencies, Safco desk tray sorters will help store and organize open projects, file folders and paper supplies at your fingertips. All steel construction has a contemporary finish that resists fingerprints. Slanted shelves with finger cut-outs provide convenient access to contents. Available in 3-, 4-, 5-. 6- and 8-tier designs to accommodate letter-size material. Rubber feet included to protect work surface.